The Wilfrid Laurier men’s rugby team captured their first medal in team history on Saturday, Nov. 10, with a thrilling 17-6 win over the Waterloo Warriors. After their loss in the bronze medal game last year, the Hawks had a lot to prove on Saturday. Add in the fact that this game was the biggest ‘Battle of Waterloo’ so far this year, there was more incentive than ever for Laurier to put up a good performance. The game got off to a shaky start for the purple and gold, as the Warriors jumped out to a 6-0 lead in the first half. The Warriors were led by 2018 OUA MVP Mitch Voralek, who scored all six of the points for Waterloo through two penalties. This was unfamiliar territory for Laurier as they had not been in many situation where they have had to come from behind. For the most part, the Hawks had dominated their opposition throughout the season, from start to finish. But the Hawks shut down Waterloo’s offence in the second half, not allowing a single point. The Hawks tied the game at six with a huge try from Aidan Nesbitt. Laurier then took the lead with 10 minutes left to play through 2017 OUA MVP, Andrew Quattrin. The fifth year veteran then capped off what was his last game for the Hawks with another try to give the victory to Laurier. Quattrin’s presence will be missed and he showed just how valuable he is to the Hawks in his final game. Another big part of the Hawks’ second half comeback was their home field advantage. The crowd were right behind the team throughout the game, and they raised the noise to another level when the Hawks finally got on the board. The Hawks made history in 2017 by winning their first playoff game in modern team history, and this year they raised their game to another level by winning their first medal ever. The fans matched the players’ intensity throughout the game. Although the Hawks’ playoff run came to an end last week, they showed no signs of a lack of passion. “Our staff is extremely proud to have been a part of this historic run for Laurier rugby. This was not something that happened over night, but has been building for the last five years. At the end of the day, it’s about the program and players, and whether or not those players buy in,” coach Ian McLeod said. The Hawks have now made history in consecutive years: last year they won their first playoff game ever, and this year they received their first medal ever. The Hawks showed a tremendous amount of resilience to come back and win this game. This victory is even more impressive than it looks because the Hawks had not been trailing on many occasions during the season, but they managed to survive the adversity when they needed to. “The process of building a winning program is ongoing and must continually be worked on month after month, year after year. We are losing some huge contributors to our program this year both on and off the field,” coach McLeod added. Along with Quattrin, Ryan Gamm, Jeff Wood, Darnell Marks, Kevin Le, Derek Boyd and Chris Williamson will also be leaving the men’s rugby program. Losing seven players isn’t easy for any sports program and these players were crucial to the Hawks’ immense success over the past two years. Although these are massive losses for the team, McLeod pointed out the fact that this will now create a great opportunity for others on the roster. The men’s rugby program has now created a winning mentality and expectations will continue to grow for the Hawks. It will be fascinating to see how the new recruits adapt to a program that is on the rise and one that is seemingly getting better every year. The Hawks are losing seven leaders and it will now be up to the youngsters to fill that leadership void that will be gone with the departure of the veterans. But the expectations for the Hawks aren’t going to change. The team is on the right track thanks to a great blend of leadership and talent from top to bottom. Under coach McLeod and his staff, the Hawks have experienced constant growth and eventual success. 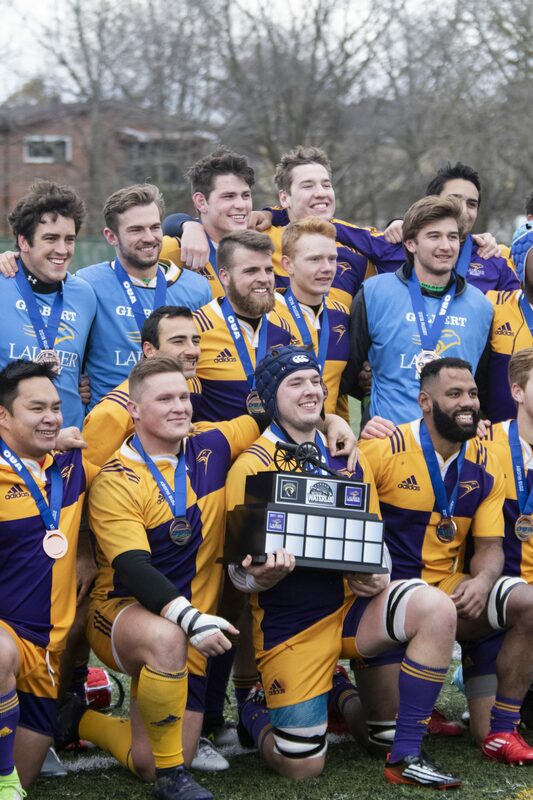 With the amount of improvement within this program year after year, the sky is the limit for the Wilfrid Laurier Golden Hawks men’s rugby team.